A heavy, earthenware mould depicting a bird eating fruit. There is an impressed 'MINTON' mark to the base but this is quite difficult to make out as the glaze has puddled into it. There is also an indistict pattern number. 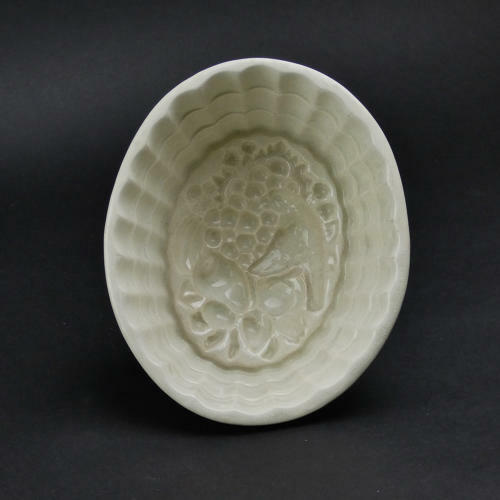 It dates from c.1860.This mould has shallow tiered sides and the design in the base shows a selection of fruits and a bird. There is a crack on the footrim but this does not go through the mould and there is also slight crazing to the glaze. Other than this it is in very good condition and it is still quite usable.